Founded in the Butter Creek valley on the southern edge of the Northwest’s fertile Columbia River Basin, Hale Farms has grown from summer pipe moving jobs for three brothers to one of the area's largest producers and land owners. 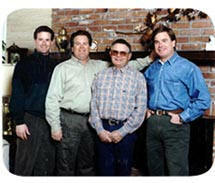 With the purchase of their first 500 irrigated acres in 1972, brothers Doug, Bob, and Rick provided the catalyst for affiliated companies that today control and/or own nearly 30,000 production acres, onion packing and fresh cut processing plants, which employs over 700 people. Upon graduating from college, Bob Hale returned home and soon thereafter, he and his brother Doug purchased the 500 irrigated acre hay farm in the Butter Creek valley near Echo, Oregon. Supplementing their income with off-farm jobs, Bob and Doug raised hay and grain until an adjacent farm became available for sale, allowing them to double their operation and farm full-time. Bob marketed the crops and ran business operations, and Doug produced them. With the help of their father, Bob Hale Sr, they diversified into cannery crops, purchased new and bigger equipment, and began experimenting with the production of potatoes, onions and other vegetables. Upon brother Rick’s return from college, coupled with his interest in intensive row crop production, the Hale brothers began expanding their vegetable production acres. In effort to support the three families, and in efforts to justify the larger more specialized equipment required for row crops on their relatively small acreage base, in the late 70’s and early 80’s, Hales entered into custom farming arrangements with local large irrigated farms. Having solid success with initial potato and onion crops, the Hales moved into the sandier and more productive soils for potatoes and onions, by renting fields on a few of the large Columbia River irrigated farms west of Hermiston, Oregon. As cash flow allowed and relationships developed, row crop acreages continued to grow. Experimenting with alternative tillage and planting methods, especially in onions, Hales were able to produce above average yields and quality. This solidified their row crop program giving them the ability to increase their land base and move up the agricultural value-added chain. Thus in the late 1980’s the brothers were able to acquire their first center-pivot irrigated farm in the Hermiston area, and rent a packing shed to market onions under their own retail brand names. Today, Hales are principals in four major irrigated projects in the southern Columbia basin and have expanded their potato and onion operations into partnerships and/or exclusive supply arrangements with some of the nation’s top processors including the J.R. Simplot Company, Cascade Specialties, Norpac’s Hermiston Foods, ConAgra Foods, Lambs and Gilroy Foods. The initial small rented onion packing facility was upgraded to a state of the art packing facility and fresh cut processing facilities that year round supplies customers, including restaurant chains, grocery chains, foodservice companies and processing plants/industrial ingredient companies. Hale Farms current production includes growing potatoes, onions, carrots, green peas, sugar snap peas, sweet corn, blueberries, field corn, alfalfa, wheat, barley and grass seed. Hales remain committed today, as in the beginning, to growing and providing quality and safe foods, and to feed people all over the world.